Are you hosting breakfast, brunch, lunch, or dinner this year? Regardless of the meal, you can set the happiest of Easter tables in a million different ways, just by changing out one little thing here and another little thing there. 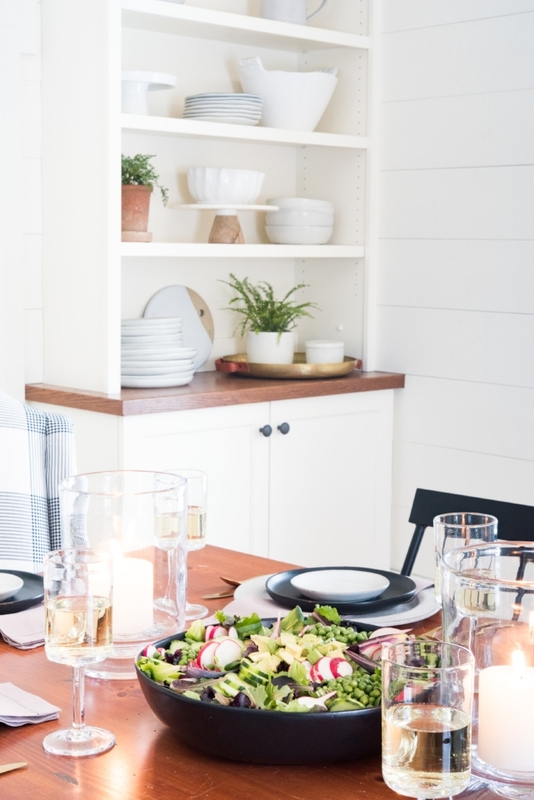 We got together with a few of my favorite brands, The Coastal Table magazine and Simon Pearce, makers of all things glass, tabletop, lighting, and home decor, to prove that point. 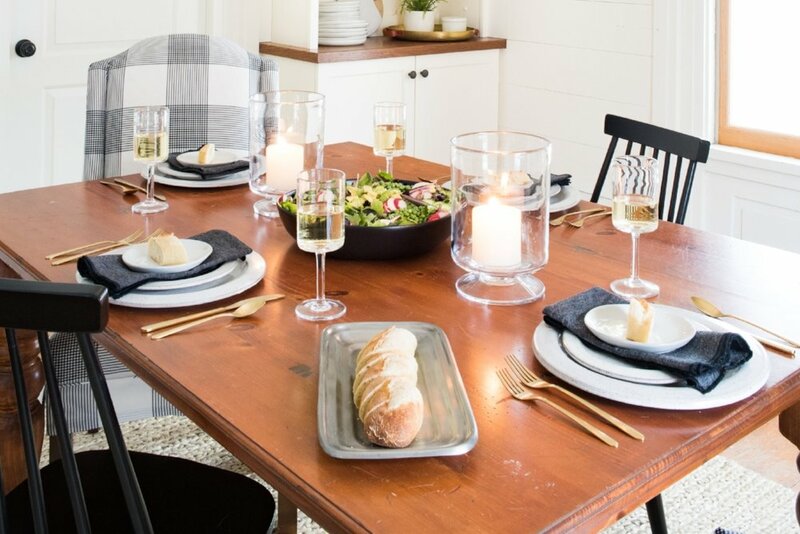 Here's our fantastic Easter table setting with silver flatware, Teaselwood pottery plates, Simon Pearce wine glasses, and Pottery Barn napkins in Wisteria. And here it is with gold flatware (both sets are from Crate and Barrel). ... and with the middle plate swapped out for something a little snazzier and a green napkin. ... and with the green napkin. Isn't it amazing how simple it is to make a table setting look so different?! So fun! With those little tricks up your sleeve, you could host breakfast, brunch, lunch, AND dinner and never have the same table setting twice! Don't you love these hurricanes from Simon Pearce? I'll be sharing the recipe for that spring salad in an upcoming post (that is, if it's fair to call the instructions for throwing a salad together a 'recipe'!). 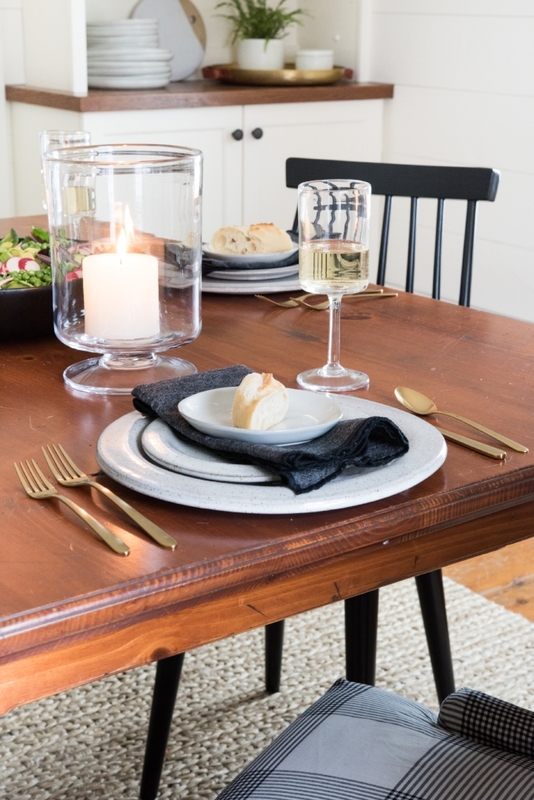 The black salad bowl is from Target's Magnolia Home collection. We're currently featured in the spring issue of The Coastal Table. In the magazine, we talk design trends for 2018 (don't worry - we'll share some trends with you in an upcoming post right here on The Farmhouse Blog!). If you don't yet subscribe to The Coastal Table, you must! It's a gorgeous quarterly magazine with a mission to "capture the true essence of the coast" using beautiful photography and storytelling. It's a total breakout star on the indie publishing scene. They've just won the IACP Publication of the year for 2018, along with multiple other awards since their inception in 2016. Whether you live on the coast or not, see where you can grab up a copy here or learn how to subscribe to the print edition here and the digital edition here. The pewter platter is from Pottery Barn. It's technically called a 'Cookie Platter' but it's just right for a loaf of crusty bread. These lovely flowers really set the mood for a cheerful spring celebration. Are you inspired to change things up on your table for Easter? Snap a pic and tag us @teaselwooddesign on Instagram!